Many don’t treat their paintbrushes and rollers with the necessary care they require. Quality brushes and rollers should last you up to 6 months of regular use if you take proper care of them. To prepare your brush, slap your brush against a hard surface to relax the bristles. Before you begin painting, you need to be cautious about the possibility of loose strands. Loose strands can be very annoying as they fall off when you brush a wall or door that you’re painting. To prevent loose bristles from hampering your painting process, pinch the tip of the brush and any loose strands that may be present should come right out. For homeowners that are using latex paints, dip the brush in water to remove any lint that may exist on the brush. Make sure the brush has dried entirely before you begin to paint so there’s no drip. A good way to accomplish this is to wipe in an X on paper towels. Some painting jobs take days or weeks to complete, and taking breaks is unavoidable. If you need to take a rest or lunch break for a couple of hours, it is recommended that you put your paintbrush in a plastic bag until you are ready to resume. If you plan on taking a break that exceeds 24 hours, you should place them in an airtight plastic bag and place in the refrigerator (not the freezer). When resting your paintbrushes make sure that you do not bend or manipulate the bristles in any way that may impact future use. If your bristles dry in a warped position, it may be difficult to use it again. Following the completion of your project, it is imperative that you clean your brushes and rollers immediately. Begin by removing excess paint that is on your brush by scraping it against the side of the can of paint. You can get even more excess paint out by combing through the paintbrush with a wire brush, so the next step doesn’t take as long. Then you can move onto cleaning the remaining paint. If the paint you are using is water-based, wash the bristles with soap and water and if the paint is oil-based, use paint thinner to clean it. Paint thinner is very harsh and it can dry your hands out if it makes contact. When cleaning the oil-based paint off a brush you should wear gloves and stay in a well-ventilated area, an open garage is usually ideal. 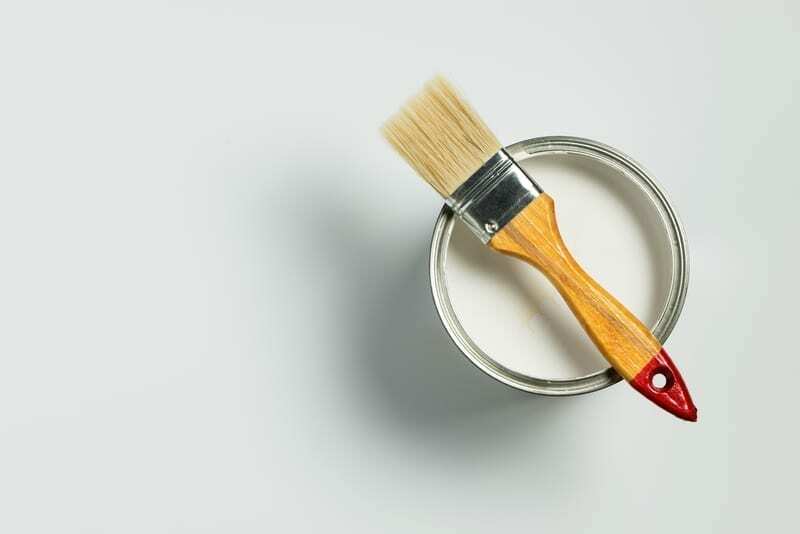 It is recommended to have three metal or plastic containers partially filled with paint thinner, so you are not putting the paint back into the paintbrush. You want to soak the brush in the paint thinner for around five minutes and then take it out and blot it on some paper towel (put some plastic underneath the paper towels). If you repeat this a couple of times in the first container you can get most of the paint out of the brush and move on to the second container which helps remove the lingering residue. When you reach the third container your brush should be almost completely clean. Once you have cleaned either your water-based or oil-based paint off the brush, lay it on some cardboard and let them dry. It can take some time to get all the paint out of the brush, however, your future self will thank you when you don’t have to run out to buy supplies when you find yourself in the middle of another painting project.